The alien planet Kepler-186f is the first extrasolar world ever found to be about the size of Earth and in the habitable zone of its parent star. But if scientists ever hope to try to find life on such a planet, giant new space telescopes are needed, researchers say. In the future, astronomers could detect hints of alien life by scanning the atmospheres of distant worlds with advanced space telescopes, researchers say. In the past two decades, astronomers have confirmed the existence of more than 1,700 worlds outside Earth's solar system. Many of these alien planets lie in the habitable zones of stars, areas potentially warm enough for worlds to harbor liquid water of their surfaces. This has inspired hope that one day scientists might detect life as it is known on Earth on such exoplanets, since there is life pretty much everywhere water exists on Earth. "Our own galaxy has 100 billion stars, and our universe has upwards of 100 billion galaxies, making the chance for life elsewhere seem inevitable based on sheer probability," she added. One strategy to hunt for signs of such extraterrestrial life involves looking for ways that organisms might alter a world's appearance. For example, key chemicals might change the spectrum of light seen from the atmospheres of those planets. These searches focus on biosignature gases — chemicals or combinations of chemicals that life could produce, but that processes other than life could not or would be unlikely to create. "In the coming decade or two, we will have a lucky handful of potentially habitable exoplanets with atmospheres that can be observed in detail with the next generation of sophisticated space telescopes," Seager wrote. "The atmospheres of a few of the exoplanets we have looked at do not appear as expected," Seager told Space.com. This suggests that researchers should try their best to expect the unexpected when building scientific instruments designed to analyze exoplanetary atmospheric compositions. In the near future, the James Webb Space Telescope (JWST), planned for launch in 2018, can study the atmospheres of dozens of super-Earths, exoplanets slightly larger than Earth. The observatory may even be able to scan a number of worlds that might be habitable. The problem with such direct imaging of exoplanets is that any nearby Earthlike exoplanets or "Earth twins" would be about as faint as the faintest galaxies ever observed by the Hubble Space Telescope. However, these exoplanets are next to parent stars that are up to 10 billion times brighter than the planets themselves. "The challenge of direct imaging of an Earth analog is similar to the search for a firefly in the glare of a searchlight when the firefly and searchlight are 2,500 miles distant, the separation from the East Coast to the West Coast of the United States," Seager wrote. To directly image Earth twins, researchers are currently pursuing two different strategies. One involves so-called internal coronographs, or systems within telescopes that can block out the light of stars to reveal the presence of any orbiting exoplanets. This requires mirrors that can focus starlight without scattering it; these reflectors must be smoothed to levels of less than a nanometer, or a billionth of a meter. (In comparison, the average human hair is about 100,000 nanometers wide.) Laboratory experiments have already demonstrated such a level of control, Seager noted. Another strategy to directly image Earth twins involves a starshade, a different system designed to hide the light of stars to reveal the presence of any orbiting exoplanets. However, a starshade does not fit inside a telescope; rather, it is a giant, sunflowerlike spacecraft. Most designs involve a starshade dozens of feet wide flying tens of thousands of miles in front of a telescope, carefully positioned to blot out the light of just one star at a time. Current lab experiments have created scaled-down versions of such devices that need to cast shadows about 10 times darker before they can find use in starshades. In the future, researchers could build very large space telescopes with apertures more than 33 feet (10 meters) wide capable of finding more than 100 potentially habitable exoplanets. The telescopes could then analyze those planets' atmospheres for biosignature gases. 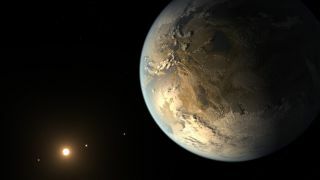 "While we are closer than ever, it will still be a while before we have the capability to study small exoplanet atmospheres for biosignature gases," Seager told Space.com.